This amount of yarn is enough for the scarf and the Jester Hat. Needles: # 2 (2.75 mm), # 10 (6.0 mm). Start with color A. On needles #10 cast on 35 sts. Work 4 rows in garter stitch and 22 rows in stockinette. Change to needles #2, color D, work 6 rows of ribbing 1 x 1. 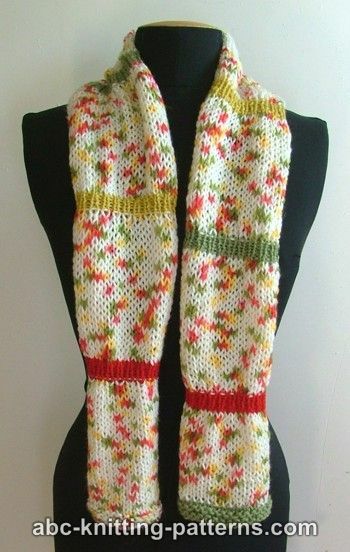 Change to needles #10, color A, work 22 rows in stocking stitch. Change to needles #2, color C, work 6 rows of ribbing 1 x 1. Change to needles #2, color B, work 6 rows of ribbing 1 x 1. Color B, work 4 rows of garter stitch. Bind off. I just saw this pattern and have the same question about the speckled patterned yarn . Is it available? Thank you. Where can I get this yarn? What is the brand & what is it called? Thank you for responding. The first part of the pattern does not seem correct. If you do 4 fows of color A and then continue in stockinette, you will not get the 4 row garter in green. 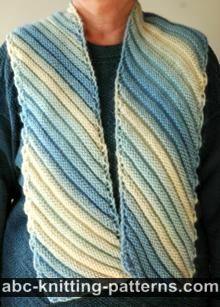 You will need to do 4 rows of garter in green and then change to the variegated yarn. 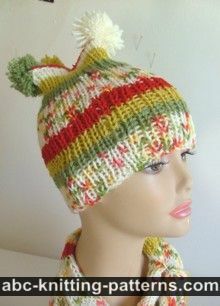 Where can I get this yarn & what is the brand name? 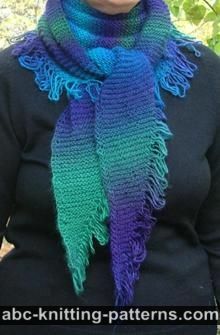 Where will I be able to purchase this beautiful yarn?